give me credit and link to my blog when using it on your site. Thanks. As a self proclaimed art licensing junkie, Joan continues to search for art licensing info and share it with other artists to help them license their own art. Joan creates art for products. Her robust body of art is in collections and Photoshop layered files that can be easily customized to manufacturer's specifications. What is Art Licensing Show? Photoshop blending modes allows you to non-destructively blend and change the pixels in the images on the layers. You can easily create special effects, change colors and hues on the layers, blend a pattern into an image, add black (or white) logos on the painting that appears to have a transparent background although the background is actually white (or black), add contrast to images, and much more. Not only can you save time by using blending modes but you can create some amazing results to enhance your art. There are over 20 different blending modes but the most used are Screen, Multiply and Overlay. 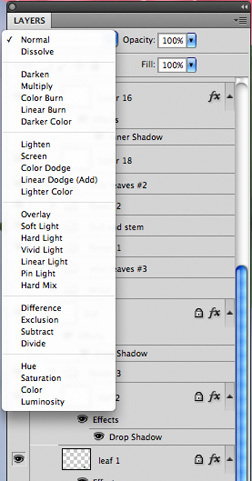 The blending modes are located on a pull down menu in the upper left corner of the Layers pallet. You can quickly scan through the different blending modes by using keystrokes Option (PC = Alt) & Shift & Plus sign (+). • Screen "Looks at each channel's color information and multiplies the inverse of the blend and base colors. The result color is always a lighter color. Screening with black leaves the color unchanged. Screening with white produces white. The effect is similar to projecting multiple photographic slides on top of each other." • Multiply " Looks at the color information in each channel and multiplies the base color by the blend color. The result color is always a darker color. Multiplying any color with black produces black. Multiplying any color with white leaves the color unchanged. When you're painting with a color other than black or white, successive strokes with a painting tool produce progressively darker colors. The effect is similar to drawing on the image with multiple marking pens." • Overlay "Multiplies or screens the colors, depending on the base color. Patterns or colors overlay the existing pixels while preserving the highlights and shadows of the base color. The base color is not replaced, but mixed with the blend color to reflect the lightness or darkness of the original color." Sounds confusing, huh? Well, using blend modes is really quite simple as you will see when viewing the videos listed below. • "Using blending modes for photographers"
• "Photoshop Tutorial: Introduction to Blend Modes"
• "Photoshop Tutorial: Blending Modes"
• "Multiply, Screen & Overlay Blend Modes in Photoshop"
" Photoshop Tutorial: Layer Blending Mode Intro"
"Photoshop Tutorial: Overlay Pt. 2 - High Pass"
"Photoshop Tutorial: Overlay Pt. 3 - Contrast"
"Photoshop CS5 #10: Layer blending options (Flame Circle)"
"Photoshop Tutorial - Using Blend Modes"
Comments are welcomed. Enter them in the below comment section. Joan, you are always a wealth of fabulous info. I will have to bookmark and come back to as time permits. thanks for sharing.